The Herring Run is held on one 10 km loop, run once or twice depending on your gumption. It is mostly on single and double track with 2 paved road crossings (one involves running .13 miles on the paved road before crossing and ducking into a 1/2 mile of dirt rd.) 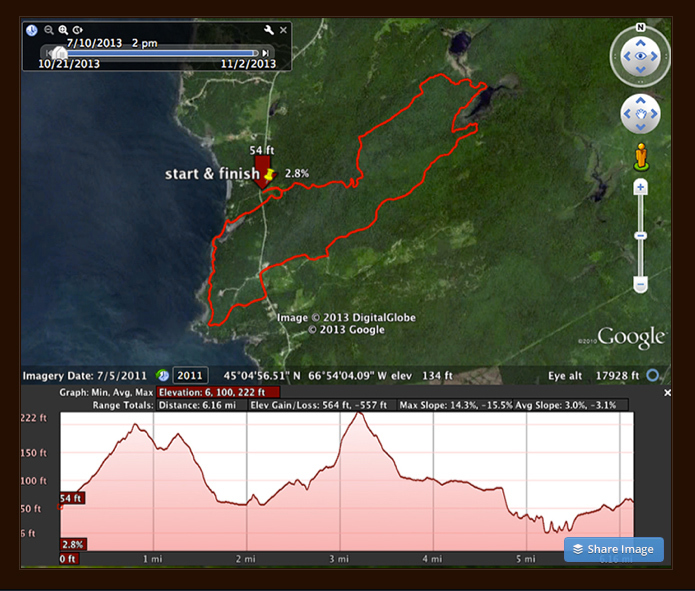 The trail runs by two inland ponds and about a 1/2 mile along the rocky shore of Passamaquoddy Bay. (pass-uh-muh-kwoddy) "The pollock plenty place". You even get to cross a good size cove at low tide. Many private landowners have been gracious enough to open up their property for such shenanigans and so we are all grateful to them.